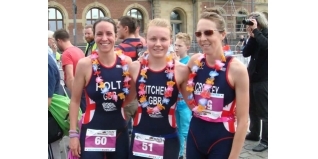 As reported separately HERE, the 2014 ETU European Aquathlon Championships in Cologne, Germany on Saturday, which was headlined by a Silver medal for Hannah Kitchen in the female Elite race. Hannah recently won the Hatch End Triathlon where she 'chicked' the entire men's field, and also finished fourth last year in the ITU World Under-23 Aquathlon World Champs in London. In Cologne she also took the scalp of current World Senior Aquathlon World Champion Irina Abysova. Check out the post-race interview with Hannah below. Richard Stannard finished 13th in the men's Elite, along with Neil Eddy (19th) and Nick Beer (24th), while Emma Holt (12th) and Eloise Crowley (15th) completed the GB Elite entry.